Description: Inscribed on the front is: "In Memorium ~ Veterans All Wars". 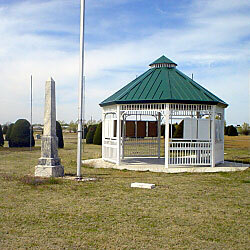 Description: Granite monument located in the center of a ring of flags. 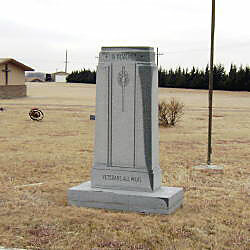 Inscribed on the front is: "This Monument Was Erected ~ By The American Legion ~ Auxiliary Of Meade, Kansas, ~ Assisted By Ex-Service Men ~ And Patriotic Citizens, And On ~ May 30, 1927 Dedicated To The ~ Memory Of Meade County's ~ Departed Veterans Of All Wars. 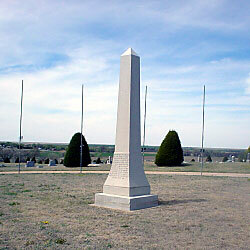 ~ It Also Replaces The Monument ~ Placed Upon This Site In 1886 By ~ Meade Center Post No. 388 G.A.R. ~ Dedicated To The Unknown Dead ~ Of The Civil War." Another side of the monument is inscribed: "In Sacred Memory ~ Of ~ Our Heroes ~ Meade County". American Legion Badge and "Lest We Forget". Spanish American War Badge "Lest We Forget". Red Cross Badge "Dedicated to Our Heroic Dead".